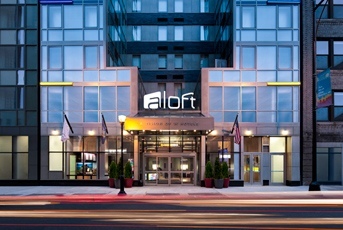 Aloft Hotel in Manhattan, NYC. Modern smartphone technology is about to make hotel room keys historical relics. Luxury hotel company Starwood Hotels & Resorts Worldwide announced today that it will begin installing smartphone-controlled door locks in its Aloft properties by this spring. To unlock your door as a guest, you’ll need to download the Starwood app to your Android or iOS smartphone so you can be sent a virtual key. You’ll then need to physically move your smartphone in front of your door for it to unlock via Bluetooth. Using the technology is entirely optional – the front desk will continue to offer guests physical keys and assist anyone having trouble with the advanced hotel technology. You can see the smartphone door lock in action in the promotional video below. Smartphone door-entry technology will first appear in its hotels in Harlem, New York and Cupertino, California by the end of the quarter. The technology is expected to be rolled out in all the company’s Aloft and W hotel properties by the end of the year.